Part of the main B5090 road through Bollington, Henshall Road runs from the junction with Bollington Road which is between Hall Hill and Moss Brow in Bollington Cross to the junction with Wellington Road at Grimshaw Lane in West Bollington. Approach from Wellington Road or Bollington Road. Leads to Hall Hill, Nursery Road, Ovenhouse Lane, The Drive, South West Avenue, Ashbrook Road, Ledley Street, Princess Street. Council Ward – From Grimshaw Lane to Princess Street/ Ashbrook Road, Central; from Princess Street/ Ashbrook Road to Bollington Cross, West. The steep part of Henshall Road from Ashbrook Road up to the junction with South West Avenue was once known as Ovenhouse Brow. See the special page on Brows. 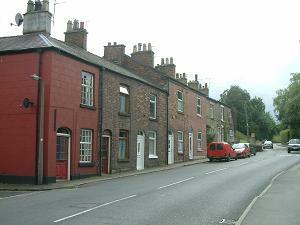 The lower part of the road from Grimshaw Lane was know as Bollington Lane in the 19thC. There is a page describing the possibilities for the vacant land alongside Henshall Road adjacent to Hall Hill, known as Hall Hill fields.